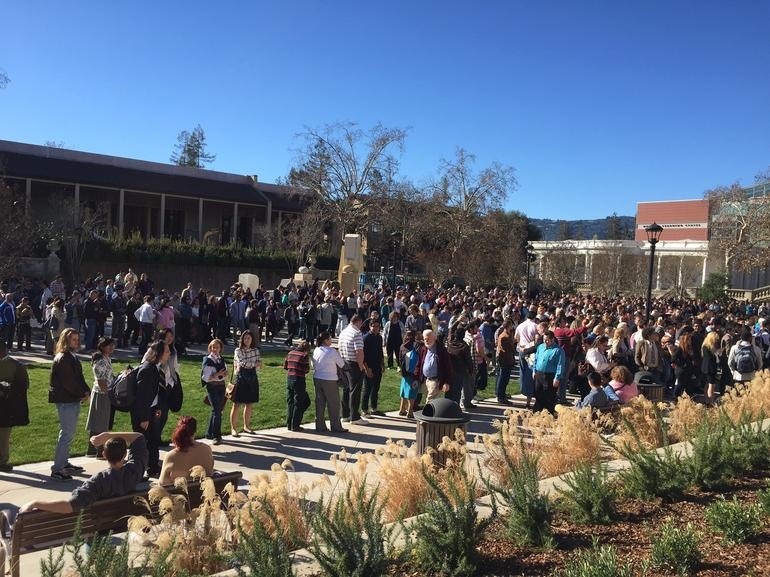 With filming on the upcoming Steve Jobs film underway in the company's hometown of Cupertino, California, thousands of people responded to a casting call over the weekend, hoping to be included as extras in scenes being filmed at the Flint Center where Jobs unveiled the original Macintosh in 1984. As reported by CNET's Shara Tibken, well over 2,000 people showed up in 80s-inspired attire to be extras for a scene in the upcoming movie, but hundreds including Tibken herself were turned away due to the overwhelming fan response to the casting call. I thought I'd have no trouble getting onto the movie set at the Flint Center here since I was "confirmed" as an extra and arrived at the designated time. Silly me. After years of covering the lines at Apple events and product launches, I should have known better. Potential extras began lining up at 5 AM despite instructions to arrive between 9 and 10 AM, with one member of the casting company calling the response "absolutely overwhelming." There were plenty of Cosby sweaters and plaid, flannel button-ups. And many women sported side ponytails and leg warmers, which didn't seem quite appropriate for Apple shareholders (Jobs introduced the Mac during a stockholder meeting in 1984). According to one of the line minders, the film will be shooting in the Bay Area for another six to seven weeks, giving aspiring extras additional opportunities to try for a spot in the film, which is planned for release next year. I actually got to be one of the extras. It was loads of fun, but no movie starts on set that day. It was a Saturday, so I was able to do it without taking off work (teacher). While I can't give away any details, because we all signed nondisclosure agreements, I can say that Danny Boyle is one of the nicest guys around. He was amazing to all the people there and very thankful to the people that showed up. Like the article states, lots of people showed up in 80's party outfits. As we walked in they picked out people that were in 80s business attire to fill out the front half of the theater. The first few rows were filled with paid extras, and then the rest of us non-paid extras. They didn't do much except film reactions, but seeing the process of how a movie was being made was amazing. But according to this site experts and armchair executives, nobody cares about this movie. Is it not true? Thousands would respond to a casting call for extras for Come On! The Steve Ballmer Story. Yes, I agree 100%. Taking part in a movie would be cool, but as I have a real job, not sure I could spend a day hanging out trying to be an extra. But it would be cool to go see a movie and see myself. I thought the 80's was the 'preppy' or 'big hair' thing. So jobs that allow for such flexibility aren't as real as yours? I always find the phrase "real job" to come across like an ultra conservative. You might be a raving liberal, but that what I hear. Like if you aren't shoveling coal everyday you aren't as good as real workin' folk. What about Kim who runs this site? I'm sure he pays his taxes like everyone else. But I bet he has more flexibility running a website than a construction worker. Doesn't make his job any less real in my mind. And those of us in CA who ski and snowboard are envious of your snow in the Northeast! When I read real job I thought of how people work 9 - 5 - 8 Monday to Friday unlike actors etc waiting on their next part that spend most of their time out of work. Many actors are out of a job most of the time then some when they've really made it choose what they want. Their accountants handle their taxes and usually find ways to pay very little tax as possible. As they can afford the best to get around the system. You could label all highly successful people the same way. At least I'm providing content and opinion. I think that's what comments sections are for.